As building codes demand homes with tighter building envelopes and continuous insulation, home builders and consumers are looking for building strategies that deliver that performance without paying a premium. 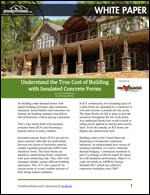 That’s why homes built with insulated concrete forms (ICFs) are becoming a popular choice in many climates. The fear in the marketplace is that higher performance comes with a higher price tag. This white paper, sponsored by Fox Blocks, explores some of the advantages of ICFs that show this construction method delivers value over the life of the home.